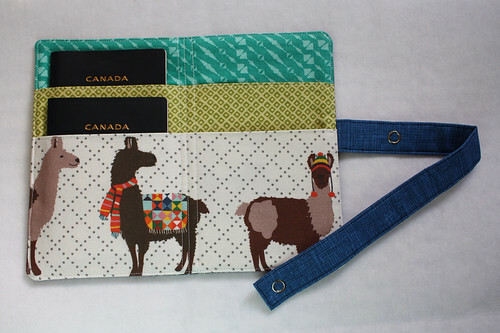 A couple weeks ago Heather posted a family passport wallet and I literally swooned. How have I never heard of such a great contraption before I wondered? 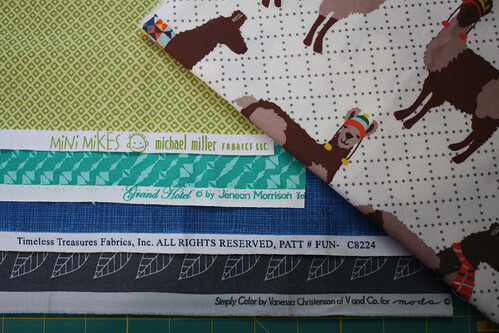 After a couple encouraging emails from Heather, I put in an order for the pattern on etsy (found here) and immediately began picking fabrics from my stash. On the outside of the case I went a little classic and understated - keeping in mind my hubs would also carry this at times, and may want a somewhat sophisticated pallet when going through international customs. On the inside though is where the real whimsy starts! Laurie Wisbrun's Llook! Llamas! collection have long been coveted prints in my stash. 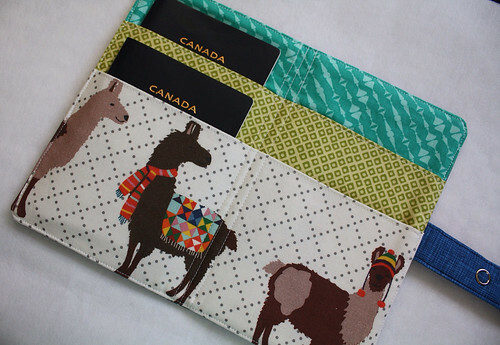 Considering how llamas are a worldly creature, and I plan to put this passport holder to good use traveling in the future, I figured that there is no better time than now to slice into some hipster llamas! We don't have a family of four, so this might seem ridiculously premature, but Mr. K and I both tend to hold on to ticket stubs, boarding passes and various paper trinkets as we travel, so I have no doubt the other pockets will be put to good use. 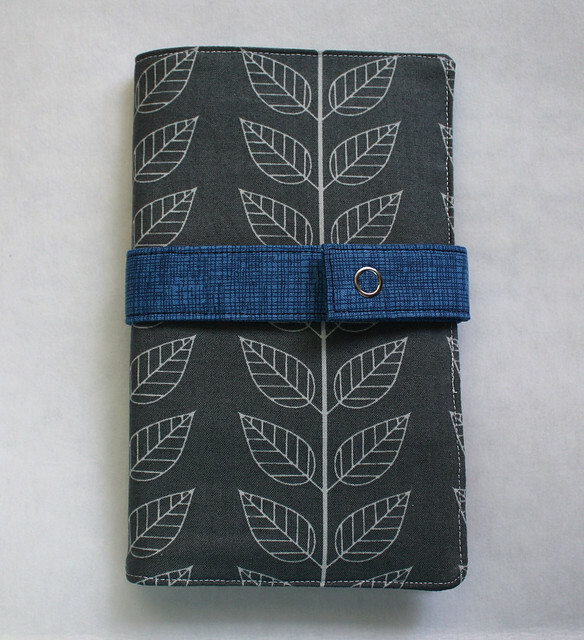 The pattern provides directions for making both a 4 slot and a 6 slot wallet so it can be customized to fit various family sizes. And for those of you that do need all four or six passport slots, it's worth while to note that there is also a great pocket on the back that is perfect for stashing boarding passes and things that require quick access. Overall I definitely think that pattern is well thought out and I imagine I'll be making many of these for friends and family in the future. Linked to: Finish it up Friday, Link and Finish Friday, and Can I get a Whoop Whoop?. I just got some of Laurie's Olive the Ostrich! Love her stuff... I wish I had those LLamas too! Thanks for sharing! Great work! Love it! I wish I had seen this when we were traveling abroad this past summer. I love this wallet. Really cute! 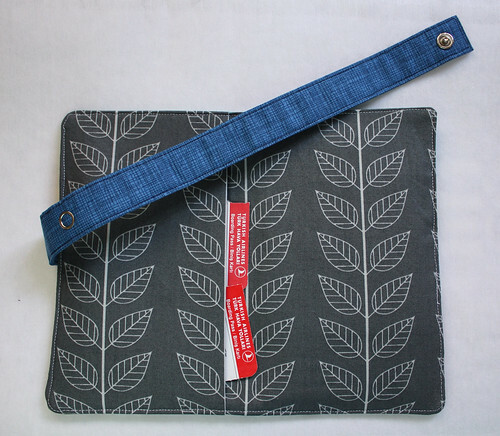 Oh what an awesome looking wallet and thanks so much for the sweet words about the pattern ;) I love it!!! Those llamas are perfect!